This Black History Month, Wounded Warrior Project salutes hidden figures in the United States military. 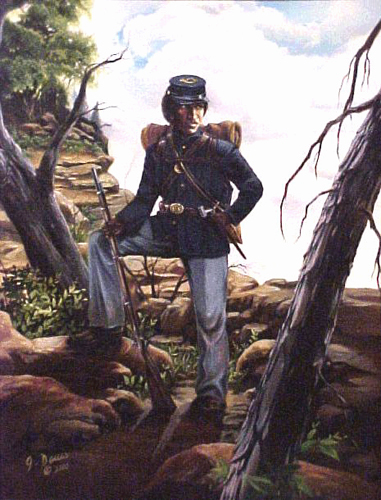 This installment honors Cathay Williams, the only known female Buffalo Soldier. Today, we use the term “contraband” to refer to forbidden merchandise of any kind: illicit drugs. Exotic birds. Twinkies® hidden under a bunk. But imagine being labeled as “contraband.” Illegal goods. A stolen thing. Property that is in a place it should not be. Born in Independence, Missouri, in 1844 to a slave mother and a free father, her name was Cathay Williams before she was known as William Cathay. She is the only documented black woman to serve in the Army in the 19th century. She is the only known black female Buffalo Soldier. Before her voluntary enlistment, her status as contraband – a captured slave – meant she was “pressed” into serving. At 17, her role as Army cook and washerwoman meant she accompanied the infantry all over the country. During these travels under the service of General Philip Sheridan, Williams witnessed the Red River Campaign and the Battle of Pea Ridge. Post-war job opportunities for newly freed slaves – and for African-Americans in general – were all but nonexistent. Inequality and lack of access bore down on African-Americans to a smothering degree, particularly in the southern states. Many had no choice but to turn to military service to afford themselves not only employment stability, but newfound access to health care, education, and post-war benefits by way of a pension. It is no mystery why Williams joined the Army after her stint as a Jefferson City house slave: the lure of independence for a young, female, unmarried former slave held an undeniable attraction. Her enlistment started in November of 1866 in St. Louis, Missouri. A cursory examination by an Army surgeon should have outed Williams as a woman, but since the Army didn’t require full medical exams at the time, Williams successfully continued her masquerade as a man. She performed regular garrison duties, but it wasn’t combat that cut Williams’ military career short: health struggles plagued her. Smallpox was the most debilitating, but back-to-back hospitalizations dealt the most devastating, ironic blow of all in October 1868: “The post surgeon found out I was a woman and I got my discharge. The men all wanted to get rid of me after they found out I was a woman. Some of them acted real bad to me,” Williams said. Her disability discharge meant the end of her tenure in the Army, but not the end of the adventure of being Cathay Williams. When the war ended, Williams signed up with an emerging all-black regiment: the 38th U.S. Infantry – which would eventually become part of the legendary Buffalo Soldiers. These units dotted the landscape of the American West and showed tremendous skill and valor in a range of duties. They fought in skirmishes with Native Americans, escorted vulnerable wagon trains, built forts, mapped the territory, and protected white settlers – all with sub-par equipment. For a while in her post-military career, Williams was adrift while she moved around to recapture the stability granted by the Army. She headed to Fort Union in New Mexico territory with her original name to work as a cook. A brief marriage ended with the arrest of her husband, who had stolen money and horses from her. She also took on jobs as a seamstress and laundress under the name Kate Williams in Pueblo, Colorado – where her mother ran an orphanage – and Trinidad, Colorado. In trying to make a life for herself, Williams could not have known her story had traveled. It landed with a St. Louis reporter whose ears were on fire with rumors of the first black woman to serve in the Army. In the Jan. 2, 1876 edition of the St. Louis Daily Times, Williams officially became a headline when her story was published. Poor health overwhelmed Williams after serving in the military. Toe amputations from diabetes, neuralgia, deafness, and rheumatism forced her to apply for a military disability pension. A doctor concluded she didn’t qualify. It is estimated that Williams died between 1892 and 1900. Many women accomplish extraordinary feats in the process of simply trying to live their lives, unaware of the far-reaching impact their determination will have. They do not cut boldly through barriers to become heroes, legends, icons, or models of pioneering tenacity – but they often become them anyway as they try to right the ship for themselves and future generations. It is no different for Cathay Williams, the first known woman to enlist in the United States Army, and the only known female Buffalo Soldier.